Pope Benedict XVI Greets the Crowd. Paradigm Trading Cards (http://www.paradigmtradingcards.com) today announced their release - "A New Pope" - a special, limited edition trading card set celebrating the life of Pope Benedict XVI. This set follows the highly successful release of a set for Pope John Paul II. Each of the 20 trading cards in the set chronicles "The New Pope's" early years, life in the church and the first few days as Pope. "The New Pope trading cards are a response to our customers. Both our retail outlets and our customers have been asking for Benedict XVI trading cards since the day we released our Pope John Paul II set," said Mark Currier, President of Paradigm Trading Cards. 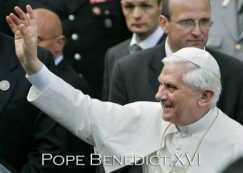 "People around the world want to learn more about Benedict XVI. What better way could there be for young people to learn about the new Pope. Trading cards have been educational in nature since they where first produced." This is a limited production run. The sets will be produced for the next six months. On November 15, 2005, the printing plates will be destroyed and the sets will never be produced again. Each trading card set has an Official Certificate of Authenticity. "When we released our John Paul II trading card set, we expected a good response, but we were still taken back by the amount of orders we received from around the world. Based on the initial enthusiasm and excitement concerning our release of Benedict the XVI, this release has the potential to be one of the most successful trading card sets ever released," added Currier. To order "A New Pope" limited edition tradition cards, or for more information, please visit: http://www.benedictxvitradingcards.com.